I love making a big pan or pot of food for my family. It’s me and Brian here, but my Mama and brother live in the area as well. I make a ton of food and share it with them. I love feeding them. They love my food. Making people food, and watching them enjoy a meal I made is a very simple thing that makes me very happy. 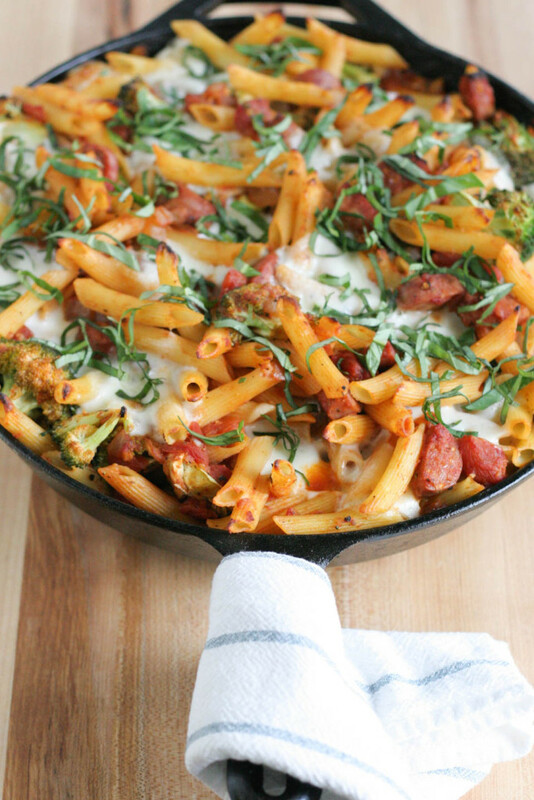 Cheesy Pasta Bake is the way to go when feeding a hungry crowd! I toyed with the idea many years ago of opening a bakery cafe. I loved the idea of feeding people, feeding their souls full of good food, nutrition, and in a most basic way, making our days a bit happier and easier with good food. Opening and running a restaurant was second nature to me. I have been a business owner in the past. I have been in the service and food industry for over twenty years. But something didn’t feel right about it. I love feeding people, I love making food. I am a professional chef and baker. Pretty good recipe to start a bakery right? Well, I began working in other bakeries, one especially that I admired, and the perfection of work that came from there would be my aspiration in my business. It’s one thing to open a food business, it’s another to do it perfectly, and only put out the best food and baked goods out. This was eye opening and honestly the beginning of then end for me in terms of my own bakery. I saw how much blood, sweat, and tears went into the perfection. The long hours, no sleep, less time, and holidays working. Things that would take me away from my family and home rather than build them stronger the I wanted. It was a hard thing to say, admit. I didn’t want to open a bakery anymore. I still have a hard time saying it. But there it is, I don’t want to open a bakery. As much as I love making and baking. As much as I know how well it would go, it’s not for me. I don’t want to die over perfection in a business away from the people I love. That is what brought me here, to this blog. So I feed my family, and share the recipes with you. That is what I love. So feed them Cheesy Pasta Bake. Note: This meal is for a huge crowd, big servings or leftovers. For less, 1/2 the amount of each ingredient for a small portion. Cook pasta while preparing the rest of the bake. Place oven rack in center of oven, and preheat to 425 degrees. 1. Add olive oil over medium heat to a 12 inch skillet, once shimmering, add onions. Cook for 5 minutes, then add sausage, brown for 5 minutes. Turn off heat stir in tomato sauce, parmesan cheese, broccoli. Add pasta, and stir. Place mozzarella on top. Place skillet in oven. Bake for 15 minutes, or until bubbly, and cheese is melted. 2. Serve warm with basil for garnish. Store leftovers in an airtight container for up to 5 days. Other easy dishes from Not Just Baked! 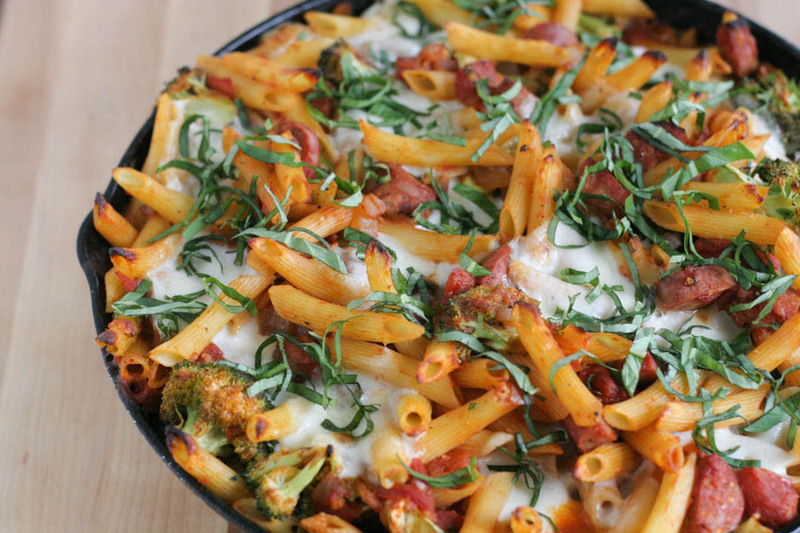 Other Pasta Bake dishes from around the internet! Love this! What a creative way to add more veggies into a pasta dish! This looks so hearty and good! Your story about wanting to open your own bakery – then not – certainly resonated with me. I have a secret dream to open a bisto or a food truck, but know it will never actually happen for the exact reasons you mention. Sometimes, fantasy is much more appealing than reality. It was smart that you tested out the idea before opening your own bakery and realizing too late it wasn’t right for you. Regarding the recipe, I love a baked pasta dish – the crispy noodles are the best part! Isn’t it though… Movies, people saying you should open a bakery, and fleeting moments of lovely bistros can be tempting. Then reality hits and reality in that scenario is not for everyone. Every once in a while a food truck will go by and I’ll think about one again but then I remember. Lol! Thanks for sharing with me too.